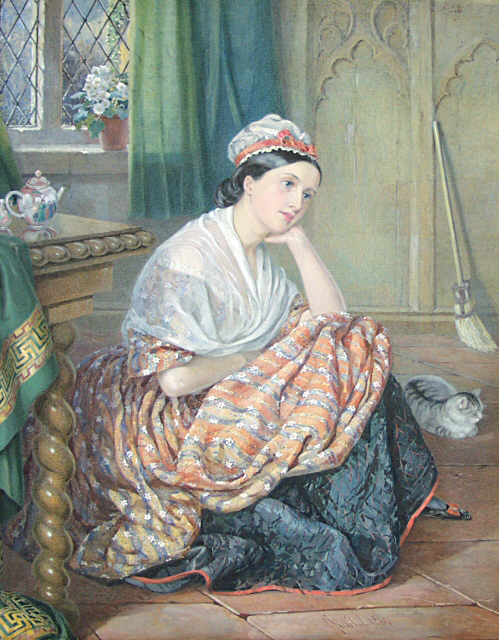 This Artwork of the Month by Isabel Naftel depicts Fanny Maule Slade as Cinderella. Miss Slade was the daughter of Lt. General Marcus John Slade, Lt. Governor of Guernsey and would have been 19 when this drawing was executed. This watercolor drawing is typical of the romantic portraits of the 19th century and is similar to those of Isabel Naftel's father, Octavius Oakley. Fairytales such as Cinderella appealed to the Victorians as the stories suited the moralising attitudes of the time. Depicting the struggle of good against evil through fantastical characters and strange lands, fairytales captivated the imaginations of adults as well as children. The early roots of the fairytale go back as far as ancient Middle Eastern oral tradition, which influenced seventeenth century stories such as 'The Thousand and One Nights'. These in turn had a strong influenced on the European fairy tale. The most well known writers and collectors of fairytales in the nineteenth century were the Grimm brothers, and Hans Christian Andersen. In England the fairytale was popularized in the 1840s with the help of the London publisher Joseph Cundall. The illustrations used in fairytale publications, were of a very high quality and artists and illustrators who produced works for such publications included George Cruikshank (1792-1878), Sir John Everett Millais (1829-1896), Arthur Hughes (1832-1915) and Walter Crane (1845-1915).